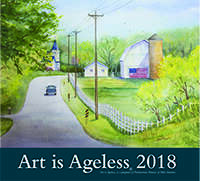 Presbyterian Manors of Mid-America friends and residents featured in the annual Art is Ageless calendars are proving that creativity is ageless since 1980. 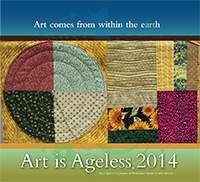 Communities host local art exhibits and competitions for residents and area artists. Both amateurs and professionals are encouraged to participate. Judges from the local community judge works based on composition, mastery of technique and overall creativity. Winners from the local competition advance to the “Masterpiece” level. All finalists are judged against each other by two to three judges to determine the “Best in Show” for both amateur and professional categories. 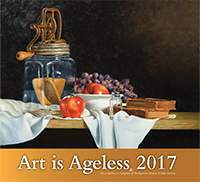 Finally, the judges are asked to select 30 amateur pieces and 15 professional pieces that will be featured in the annual Art is Ageless calendar. 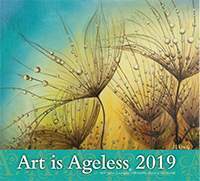 Both the print and electronic versions of the calendar have been recognized by the Mature Media Awards, MarCom Awards, Health Care Marketing Awards, and the Hermes Creative Awards. Cover art for the calendar is "Bubbles" by John King, Emporia. Best in show winners are "Wait For It" by Wayne Keeling, Salina, amateur, and "Grateful" by Anita Alsup, Farmington. Cover art for the calendar is "Oh God! Oh Country!" by Janet Kraus, Farmington. Best in show winners are "Girl Reading a Book" by Phill Gonzalez, Dodge City/Manor of the Plains, amatuer, and "Lighthouse" by Tony Fornelli, Fort Scott, professional. Cover art for the calendar is "Churn 'N Apples" by Skip Kreibach, Wichita. Best in show winners are "Farmer and His Vintage Combine" by Juanita Rapp Wyman, Farmington, professional, and "Johnny" by Lee Schmelzle, Aberdeen Heights (Kirkwood, Mo. ), amateur. 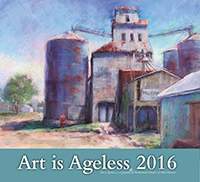 Cover art for the calendar is "Kansas High-rise" by Elizabeth Corbette, Wichita. Best in show winners are "Angel's Lost Wing" by Helen Kripplaben, Farmington,amateur, and "The Bala Railway Bridge" by Fredric Coward, Wichita, professional. 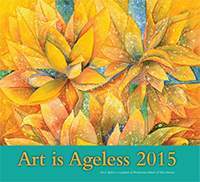 Cover art for the calendar is "Tropical Foliage" by Paul Johnston, Emporia. Best in show winner is "Tropical Foliage" by Paul Johnson, Emporia. First place overall is "Hurry Back" by Nancy Luttrell, Wichita. Second place overall is "Caribbean Flamingo on Valentine's Day" by Mary Ann Drum,Newton. 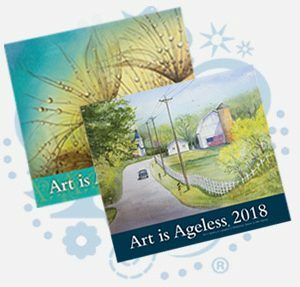 Cover art for the calendar is "Center Pivot Irrigation" by Mary Burchill, Lawrence. Best in show winners are "Cranberry Alpaca Shawl" by Micki Currie, "Matthew 6:26" by Ernestine Medley and "Acanthus Leaf Mirror" by David Butts.